Weddings Costs > How Much Do Corsages Cost? How Much Do Corsages Cost? A corsage is a small group of flowers that can either be worn on the wrist or pinned to a jacket or dress. Corsages are commonly found at many events, including dances, proms, formal events and weddings. The corsage is made to coordinate the colors and style of the event. For example, if attending a high school dance, the guy may buy the girl a corsage that complements her dress and his shirt. For a wedding, corsages are usually worn by the groomsmen, since the bridesmaids have bouquets, and are made to match the colors of the wedding and to complement the flowers used for decoration. 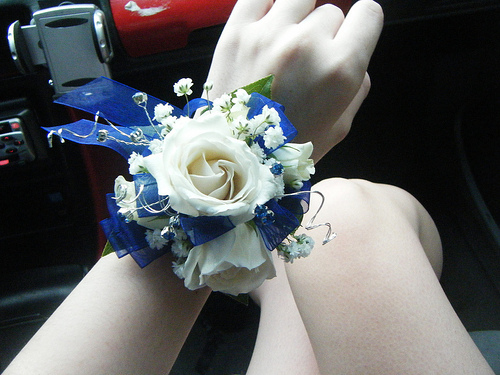 “Corsage.” (CC BY 2.0) by Holly Leighanne. How much does a corsage cost? The price of a corsage will depend on the flowers being used, the design, where you live and the florist you choose. A fresh flower pin-on corsage, on average, is going to cost anywhere from $5 to $65. The price will continue to rise as you customize it and add add-ons. The rule of thumb, at least according to tiptonhurst.com, is to spend 10 percent of dress cost. A corsage that is worn around the wrist can cost $5 to $15 more, but this higher price is due to the fact that a wrist corsage is significantly larger than a pin-on corsage. The type of flower, as mentioned, will affect the price of the corsage. A corsage made from a higher-end flower such as a rose can cost $35 to $45 while a carnation will be considerably cheaper. Silk flowers can cost anywhere from $10 to $25. FTD, a popular florist online, has a great selection of corsages that range anywhere from $25 to $65. Their White Calla corsage, for example, retails for $24, while their Poetry(TM) package retails for $65. This Family CEO Blog broke down the prom costs and said a corsage cost $38.12. A small corsage will have one to two flowers, while a larger corsage can have as many as six flowers. Coupled with the main flower, a corsage can be surrounded by greens and baby’s breath. A pin-on corsage is often used for a man’s suit, and these are commonly referred to as boutonniere Along with the corsage will be a stem that can be pinned directly to the suit jacket, and the pin will be given with the corsage. Corsages that are not pinned on will have an elastic strap that can be adjusted around the wrist. Corsages can also come with different colored ribbons or bows that can be matched to the flowers or the colors of the outfit being worn. It is so important that something such as a corsage is ordered in advance. Rushing at the last minute can lead to fees that can increase the cost by more than two times the price. To play it safe, order a corsage at least four weeks ahead of time. Ordering online can often incur additional shipping fees, depending on the retailer’s shipping policy. A corsage can commonly be found at all local florist retailers, online or even at a local grocery store inside the florist department. Try to pick up the corsage the day of the event. Since the florist will know how to properly store them, this will reduce the chance of the flower wilting before the event begins. Some florists often have corsages on display that you can purchase right away. By avoiding a custom order, this is a great way to save a few dollars. However, this will not guarantee that you will find one to match the colors of the event or dress. If this corsage is for a prom date, be sure to know what kind of dress she is wearing. A strapless dress will require a wrist corsage, while one with a strap can use a pin-on. It is also wise to have the corsage match the dress color. Corsages can be dried out in the same way that a bouquet of flowers can be. This will allow you to have the corsage as a keepsake of the event. Proper etiquette says you should wear it on your left wrist. If you’re unsure which colors will coordinate with the corsage, a good florist can work with you if you bring in a picture of the dress being worn. If the corsage is going to be used for the wedding, see if you can take advantage of any wedding bouquet deals. You may find that many florists can include the bouquet, bridesmaids bouquet and more in a packaged deal. These deals can save you more than 20%. Depending on the season, flowers will vary in price. Ask the florist what flowers are in season so you can get the cheapest and freshest flower possible. For those that are creative, try creating your own corsage. Those who are thrifty say to check out your local grocery store. While these stores won’t hire professional florist designers, you can find a corsage here for almost half the prices noted above. For example, Publix, a popular grocery store chain down south, can cost about $15.